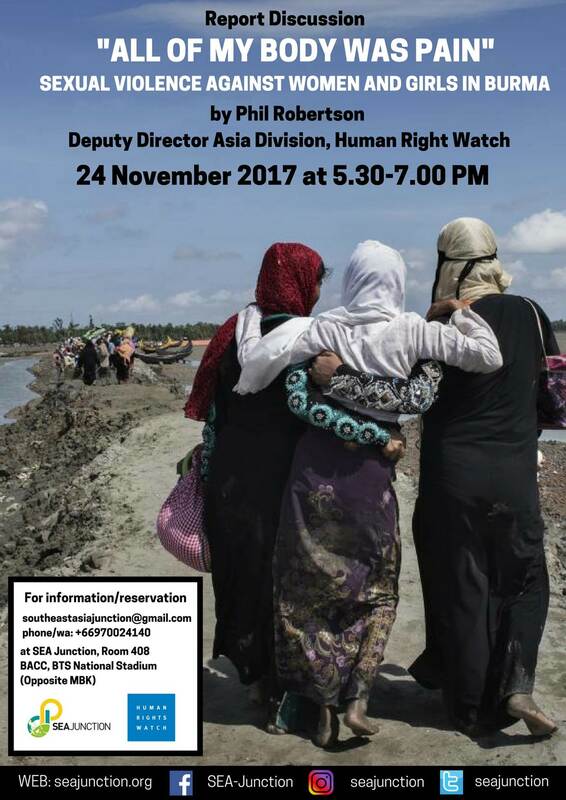 On 24 November 2017 at 5.30-7 PM at SEA Junction, Phil Robertson, the Deputy Director of Human Rights Watch (HRW)’s Asia Division, will discuss the recently launched report “All of My Body Was Pain: Sexual Violence Against Women and Girls in Burma. His presentation will once more underscore that “violence against women and girls is one of the most widespread, persistent and devastating human rights violations” and the need to subscribe to the call “Leave no one behind: end violence against women and girls” of the 16 Days of Activism against Gender-Based Violence campaign from 25th November to 10th December, which is Human Rights Day. The activity further complements the month-long exhibition “Shift Maps” which can be seen at our venue until 4 December as part of the series on movements of people in Southeast Asia entitled ASEAN People in Flux, which is organized by SEA Junction in collaboration with the Heinrich Boll Stiftung Southeast Asia. The exhibition highlights the personal live histories of refugees and migrants living in Bangkok, including Burmese, as written and illustrated by them on palm leaf manuscripts made from the Talipot Palm, also known as the ‘Shadow Palm’ (Corypha umbraculifera; Thai: Bai Larn). Phil Robertson, deputy director of Human Rights Watch’s Asia division, oversees the organization’s work throughout Asia, especially in Southeast Asia, North Korea and Japan. Prior to joining Human Rights Watch in 2009, he worked for more than a decade in Southeast Asia on human rights, labor rights, protection of migrant workers, and counter-human trafficking efforts with a variety of non-governmental organizations, international and regional trade union federations, and UN agencies. As program manager of the UN Inter-Agency Project on Human Trafficking (UNIAP), he oversaw the successful negotiation of the first regional inter-governmental agreement on human trafficking in the greater Mekong sub-region. Prior to UNIAP, he led the Mainland Southeast Asia office of the AFL-CIO’s Solidarity Center, working on trade union rights, democratic political reform, and rights of migrant workers, focusing primarily on Burma, Cambodia, Laos, Malaysia, and Thailand. A 1997 graduate of the Johns Hopkins School of Advanced International Studies, he is fluent in Thai and Lao.